The Year To Max Out Unused RRSP Contributions! As the Federal and Provincial governments get their own financial houses in order, they are lowering our tax rates. 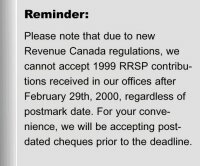 This is normally good news, but it does lower our tax rebates from RRSP contributions. To receive the maximum bang for your buck, RRSP contributions should be used against 1999 income rather than waiting for the 2000 tax year and beyond. For example, using the proposed tax cuts for year 2000, an Ontario tax payer earning $60,000 per year and contributing $10,000 into an RRSP will receive $153 less in tax rebates in the year 2000 versus 1999. This is a decrease of 4% year over year and a loss that will increase as further tax cuts come our way. We suggest that you consider an RRSP catch-up loan and for ScotiaMcLeod customers, Scotiabank offers these loans at preferred rates. If you wish to take advantage of this offer, or find out more information, contact your nearest Scotiabank branch. You do not need to be a current Scotiabank customer. Canadians have lobbied the Federal Government for years to increase the foreign content limits on RRSPs, but to no avail. So in 1999 the mutual fund industry solved this problem by offering 100% RRSP-eligible foreign funds (see past MFR issues 149 & 151). As Canadian stock markets represent only 2.3% of global markets, it makes sense to take advantage of this opportunity to invest in global funds, which have delivered higher returns with lower risk than some Canadian funds. For a current list of 100% RRSP-eligible foreign funds and our top picks, see: www.mutualfundreporter.com/investor_education/foreign/ or call us at (416) 863-RRSP or 1-800-387-9273. Many managers are still saying that this is the year for the Canadian market to outperform. With that in mind, we are adding a new fund to our recommended list from Synergy Asset Management Inc. 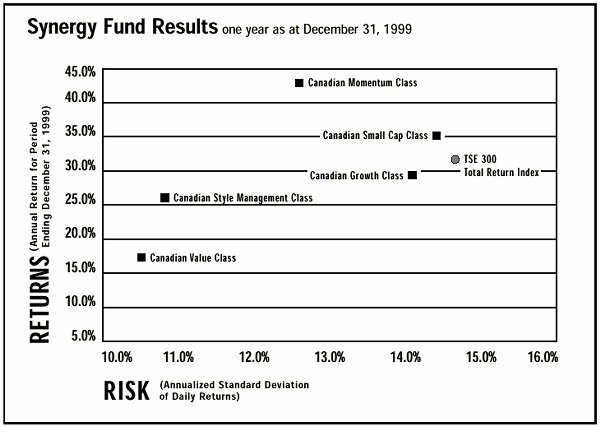 The name of the fund is Synergy Canadian Style Management Class. The fund is co-managed by Dave Picton and Andrew McCreath. Picton has been heralded as one of Canada's brightest managers. The Canadian Style Management fund has the flexibility to vary the management style (i.e. from growth to value to momentum to small cap) to take advantage of changing trends. The fund has delivered superior performance with low risk (see chart, below). You want 'em? We got 'em! Your ScotiaMcLeod account offers over 20 index funds including TD Greenline, Royal and Altamira. Scotia Funds has the advantage of offering the lowest minimums with no loads. We should point out that index funds are far more risky than many people think and more risky than many of the funds on our recommended list! 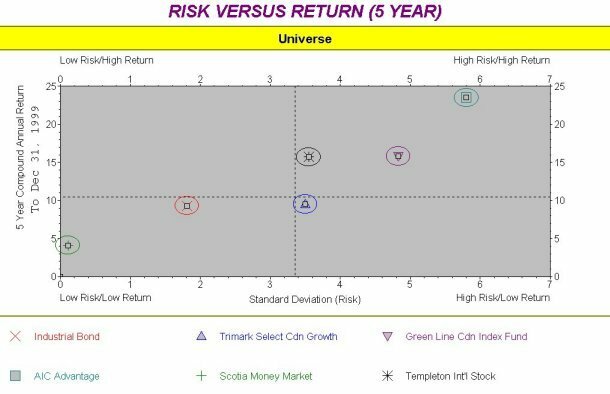 See graph, below, for further details or visit www.mutualfundreporter.com/investor_education/indexfunds/. Interest rates have been increasing and when you look at real returns (the yield of the investment minus the inflation rate), we find them very attractive! Contact us for recommendations. Vengrowth Fund, a labour sponsored fund administered by BPI, has been capped. A new fund, Vengrowth 2, is being being offered in its place by Mackenzie Financial. Although it has different holdings and is essentially a new fund, they are using the same approach and the same investment team. AGF has introduced a new 100% RRSP-Eligible Foreign Fund. The AGF RSP International Value Fund. The Scotia Capital Fee of $25.00 on No Load Mutual Fund orders will no longer be charged.